In need of a durable storage system for basements or garages? The rugged line of Ultra Totes feature durability and strength for added peace of mind that contents will stay safely stored inside. The 25 Gallon Ultra Tote makes a great solution for storing away camping supplies, sporting equipment, and seasonal items in more challenging environments. 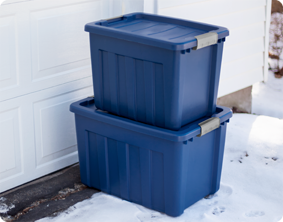 Made from polyethylene, these totes are rugged and impact resistant even in colder temperatures, making them ideal for more active storage needs. Contoured end panels and robust latches make for a sure and comfortable grip when carrying. The latches also offer extra security that the lid will stay attached to the base, and contents in place. 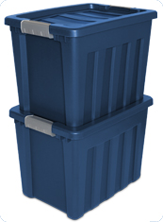 Deep recessed lids allow multiple totes to stack securely for efficient use of vertical space, while the channeled walls and thick reinforced rim provide added strength and rigidity. The overall dimensions of this item are 27" x 18 3/4" x 16 7/8". 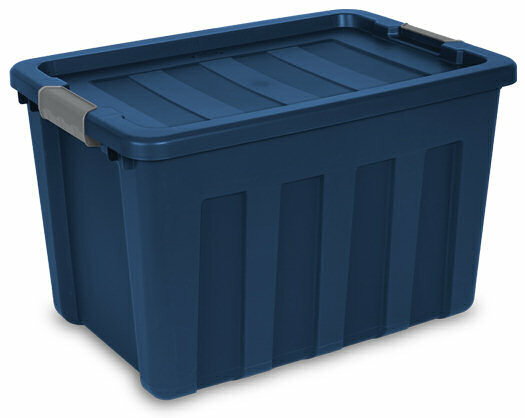 Overall Assembled Size: 27" x 18 3/4" x 16 7/8"
Designed for active storage needs, these totes can help organize and store power tools, equipment and more, while integrated handles allow for easy transporting to and from the job site. 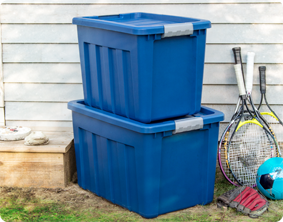 Store away sporting equipment and other bulky items in the durably constructed Ultra™ Totes. 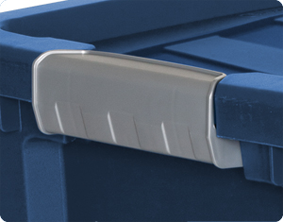 Recessed lids are kept in place with robust latches, allowing for secure stacking and efficient use of storage space. 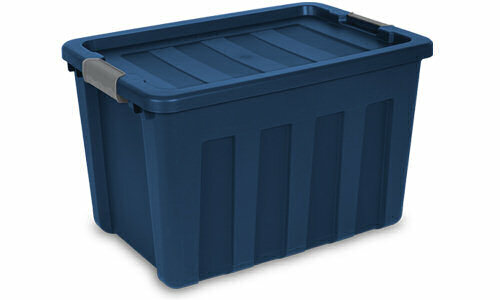 Ultra™ Totes are cold weather and impact resistant making them ideal for storage needs in garages, basements and sheds. 25 Gallon Ultra Tote is rated 5.0 out of 5 by 5. Rated 5 out of 5 by JennyBenny from Extremely durable when using outdoors. Bought this tote 8 years ago and have kept it outdoors everyday since and am only now needing to replace it. Through many snow and rainstorms this tote has lasted a lot longer than I had ever hoped. Great product worth every penny. Rated 5 out of 5 by Mack789 from Durability and Usefullness I would at a day camp in the summer and we have had issues with mice getting in our storage containers and we have had issues with our totes not stacking well. This summer I was able to purchase a load of this particular tote and other sizes to put our various equipment and materials in. They are very strong and will keep out the mice. They stack nice. And they look professional. We have left a couple of these totes out in the rain with t-shirts in them and our t-shirts were completely dry. They are fantastic. I highly recommend them. Rated 5 out of 5 by GDub from Great item! I love this tote and it is very durable. I have a few of these in my garage. Rated 5 out of 5 by BHM from We love Sterilite products. We love your products . At the library, use them for nursery crates. We fill them with 20 books and distribute to day cares and nurseries. 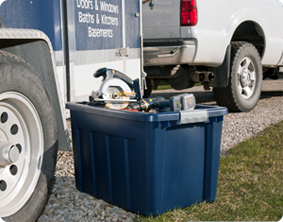 Rated 5 out of 5 by Gegorie from Latch totes really help organize all my tools I have a construction business and it's really important to me to keep my tools organized in my truck and help protect them. These are some of the best totes I have bought as they really hold up under much usage and stack really well. I have dropped them a few times carry tools from one job to the next but these really are impact resistant! I plan to purchase more soon.